I rejoined the CW Operator’s QRP Club Inc. after a long absence. I was surprised to discover I’m entitled to my original membership no #56. It’s probably been almost two decades. I have fond memories of the Lo-Key magazine, but I’m also keen to have a go at the club’s Milliwatts per Kilometre Award! 10,000km on 5W or 1,000km on 500mW! 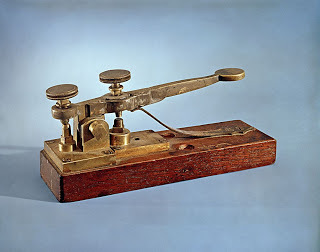 Samuel Morse was born 219 years ago. But of course credit for devising the code that bears Morse’s name goes to his assistant (machinist & inventor) Alfred Vail. His birthday is 25th September 1807. A replica of the key built by Alfred Vail as an improvement on Samuel Morse’s original ‘transmitter’. But make sure to check out the new training section on the SKCC site featuring mp3 files prepared by John KF7BYU. The War of the Worlds, The Gettysburg Address, The Jabberwock, The Night Before Christmas, Hams Christmas and The Raven. Ron on the CW list describing how he broke through his own plateau. Extreme Farnsworth. 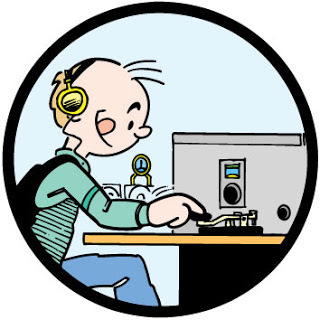 I’ve only just discovered K3WWP’s CW and QRP site via NW7US’ http://cw.hfradio.org/. 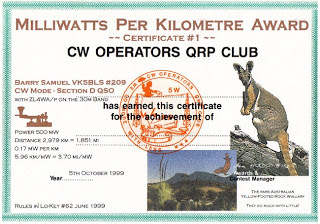 Amazed at the continuous record of publishing online since 1996 and the simple but powerful commitment to have at least one CW QRP QSO every day (a little like the necessary resolution of any half serious blogger!). What a model! And what a wealth of good info there is online for the CW and QRP fan. Which makes the challenge of actually getting on the air and operating even greater! Looking forward to exploring the K3WWP site further.